Report on the second Ysselmeercontest held on saturday 29 mei. The contest around the beautiful Ysselmeer was blessed with wunderfull weather, nice sunshine and very little wind. Some participants got them self a big sun-burn because of the wunderfull weather. At 9 different sites arround the Ysselmeer microwave stations were active. This year we had two participants coming from Belgium but unfortunately no participants from Germany. The contest was also announced for home stations but these could not win the contest. The home stations participating gave some extra chance to work longer distances which was succesfull. As far as my information is at this moment several stations worked with G3LQR and G4DDK and some with extreme strong signals on 10 GHz. Test on 24 GHz although did not succeed to the UK. Nice contacts on 24 GHz where made with as far as known best contact between PA3CEG and PA3AWJ over 119 km. On 47 GHz one contact was made between PAoJGF and PAoHRK. 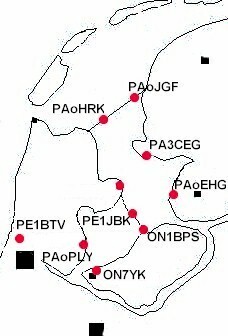 The test between PAoEHG and PAoHRK over 47 km failed. 47 GHz: 1 QSO between PAoJGF and PAoHRK over 7 km. Because the contestrules were that only with minimum of 3 logs there is a winner we don't have a winner this year.